On a narrow cliffside path overlooking a river, Usagi and Gen find themselves attacked from both sides by the Neko Ninja clan. After a brief skirmish, the pair of masterless samurai dive into the rapids below and narrowly escape the Neko Ninja’s archers. Two miles downriver, they beach themselves, exhausted, and are met by an old rat; Kakera-sensei. Kakera informs them that they’re right on time and invites them back to his home for supper. Hungry, Usagi and Gen decide to follow. After dinner, Kakera explains that the Neko Ninja have surrounded his village, not letting anyone come or go until Kakera gives himself up. Elsewhere, at the HQ of the Neko Ninja, the current Jonin, a kunoichi named Chizu, is having an argument with her subordinate, the bitter Gunji, who thinks she’s unqualified to lead the clan. Chizu does not want to lay waste to the village in order to acquire Kakera, but Gunji reminds her that the Neko Ninja clan have recently fallen out of favor with their Lord Hikiji, who has taken a fancy to the Komori Ninja clan. If they do not get results, they will lose their place forever. Before blows can be traded, Gunji and Chizo spot a pair of Komori Ninja spying on them. The bats attempt to fly away, but Chizo and Gunji bring them down. Realizing the threat the Komori Ninja represent, Chizo declares war. Back at the village, Kakera refuses to tell Usagi and Gen what the Neko Ninja clan wants with him, at least not until the other samurai he summoned for have arrived. A young boy then enters with a grim package: the head of one of the samurai! Kakera realizes that the only way to fight ninja is with ninja. *Leonardo last met Usagi in “The Treaty”. The story continues in Usagi Yojimbo (Vol. 2) #2. *This issue also contained an unrelated back-up story, “Jizo”, also by Stan Sakai. *This issue was collected (albeit in black and white) by Dark Horse Comics in Usagi Yojimbo Book 8: Shades of Death. *”Kakera” (欠片) is, of course, Japanese for “splinter”. Stan Sakai really is a master cartoonist, and if I had the dough, I would pick up that hardback anniversary collection that Fantagraphics published last year containing the entirety of his first volume of stories. And I may do so, yet, if I can scrounge the funds together. Usagi Yojimbo is just great reading. 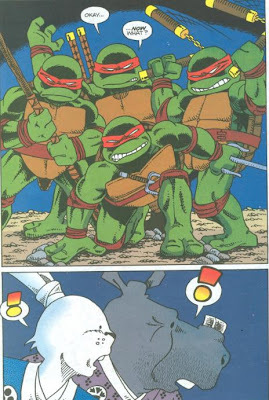 The six crossovers between Usagi Yojimbo and the TMNT form a very fun and well-crafted narrative, with the second half (the “Shades of Green” three-parter) being the more epic of the series, bucking the “guest cameo” gag strip nature of the first three strips and really giving the Turtles and Usagi an adventure to sink their paws and flippers into. One of the things that’s so positively enjoyable about Usagi Yojimbo as a rule is that, despite decades and decades of ongoing stories and character development, the series never becomes mired in continuity, always remaining accessible to new readers while appeasing seasoned fans all the while. Though comparatively early on in Usagi’s career (he first appeared in 1985), this first issue tells you everything you need to know about the characters and their world in the first couple pages, getting audiences quickly on their way. 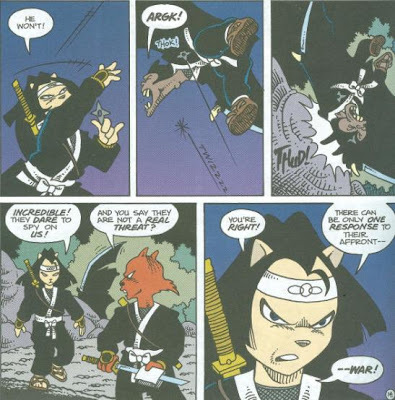 There are references to past stories involving Usagi’s encounters with the Neko Ninja clan, but they don’t muddle the story’s comprehensibility in any way, flowing naturally and unobtrusively. 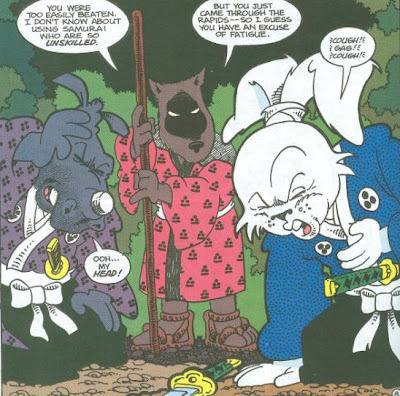 And, like I said, this comes as a “rule” to Usagi Yojimbo comics as a whole, not just first issues. You can pick up the story practically anywhere you want and follow along with few obstacles. The story in this first chapter breezes by quickly, but the build-up to the Ninja Turtles' appearance is well done. Kakera-sensei looks exactly like Splinter (and the reference is even more obvious when you know Japanese), which makes for a fun gag, if only because I enjoy seeing how Sakai renders the established TMNT cast. 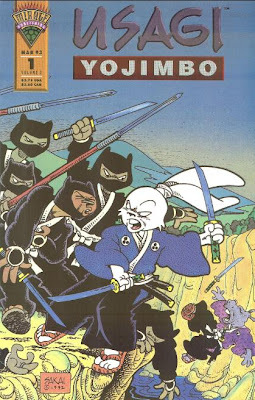 Tom Luth’s colors are a nice bonus, though as Usagi Yojimbo comics go, they’re drawn to function just as well in black and white, so you aren’t really losing anything in the trade-off if you go for the graphic novel reprints. I’ll admit, though, that the two-page spread of the Turtles appearing in a cloud of magic smoke on 18-19 has some extra oomph to it thanks to the colors. I don’t normally talk about these when they aren’t TMNT-related, but the back-up story, “Jizo”, is a beautiful short. Done primarily in pantomime (save for some bookending dialogue to set up the story), it tells a simple yet touching tale across eight pages, each with the same panel layout and visual POV from start to finish. While this issue is pretty much all set-up, it’s set-up that comes with a cool pay-off. “Jizo” alone is worth snatching up this issue or the graphic novel it’s collected in. Because Volume 4 will never get finished, I have decided that in my own canon, the Usagi Splinter is the one we see in the end of the last Vol. 4 issue. BTW, the collected version of Mirage's Usagi was re-inked to give more detail as a tradeoff for the loss of color. great review. I recently reread the dark horse TP black and white volume. I didn't realize the original was in color. You're spot on about the panel where the turtles appear. It carries a lot more weight to it in color.